I found the film on a Russian video site. There's a scene where a character goes on the London Underground (starting at 10:06), which I'm pretty sure is the East Berlin U-Bahn mixed with shots of the real Underground. I think, some scenes were really from Britain, for example that with the Vauxhall Viva. Cars, plates and the houses in the background seems to be authentic British. Interesting, that the scenes with the high-price cars as the 300 SL were obviously made in the East. Where, in the Baltic SSR's maybe? Otherwise there is also a Barkas to see, also 3 Wartburgs on the BMW-pic, and GDR-cars weren't exported to the USSR. Or was filmed in Poland? I cannot see DDR-typical details (/vehicle_326316.html). As many cars have black, rather Polish looking plates, I think more in that direction. Also the big mount of Western cars makes it very unlikely. Russian wikipedia sais it is basicly Estonian SSR. This film reputedly inspired Vladimir Putin to join the KGB. Quote One of his memorable film-works is the character of a Russian spy 'Ladeinikov' in 'Myortvy Sezon' (The Dead Season, 1968) by director Savva Kulish. That film role provided Banionis with an auspicious connection. In 2004, the actor had a meeting with the Russian President Vladimir Putin. Mr. Putin confirmed that he made up his mind to become an intelligence officer after seeing Banionis in the role of a Russian spy. Part of movie was filmed in London. They had some BMW's in GDR as well - remember "Życie na goraco"? Maybe something was filmed in Finland"? On the other hand in GDR, even if it was not visible in ordinary traffic, for sure they had enough such cars to make a fake loaction - same like in many other COMECON countries. On the other hand in GDR, even if it was not visible in ordinary traffic, for sure they had enough such cars to make a fake loaction - same like in many other COMECON countries. Exactly with that I cannot agree, with the "for sure they had" - they had not! A few, yes, but not so many and such models as visible here. As we had discussed sometimes ago, the DDR was, with the USSR, the COMECON-country with the absolute strictest laws about the import of Western cars. And for sure this amount of American cars, also the 300 SL, was surely impossible there. I think, 3loader is correct with Estonian SSR. Not only the cars are unlikely for the DDR, the historic architecture is it, too. This ancient town is definetely not in the DDR, there is no place with this architecture. So these windows were typical for around the Baltic Sea - but this town is definetely not in the Northern DDR or along the Polish coast. The ancient German architecture there is different. Hmm, my wife is already sleeping, so I cannot scrabble round in my photo albums, but could the old arch, where the unknown Jeep is driving through, be in Tallinn? The gate with the oldest relief of the "Danebrog", which becomes the Danish national flag? 3loader, I think you missed some cars. 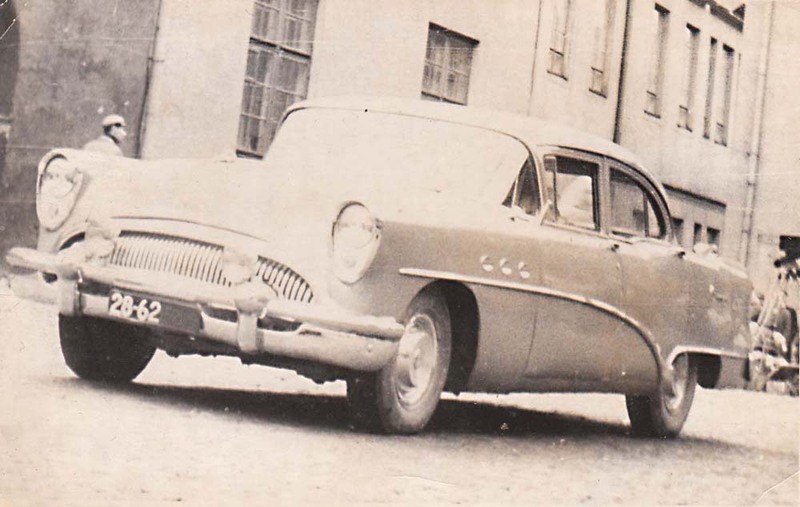 Supposedly this 1954 Buick Special: http://eag.vanatehnika.ee/a-y/Buick_1954-d.jpg is in the film as well. This is part of a sequence filmed on the Berlin U-Bahn with shots of London Underground trains spliced in. You can clearly see U-Bahn and S-Bahn entrance signs at 11:56. Can be seen here (with English subtitles).